As the partial U.S. government shutdown enters its 8th day, it is worth taking a moment to look at how the U.S. government defines “essential” government services, how U.S. national security is affected by that definition, and how preparedness for natural and climatic risks fit into that picture. As Mike Konczal notes, it’s not just national parks and zoo cameras that feel the hit. It’s a whole array of services that seem critical to the healthy functioning of a nation-state – particularly one with such significant global responsibilities. And in an era where natural and climatic hazards are on the increase, it will be important to assess whether or not “preparation” for these risks is deemed “essential” in the event of future gridlock. First of all, it seems that “essential” is a narrowly-defined term in this case. All sorts of services and resources related to reducing security risks, whether those are risks from terrorists or natural disasters, have been effectively deemed non-essential. This chart provided by CNN shows a vast array of shutterings and furloughs for offices and personnel that seem to be very important for security – physical and economic. This includes 400,000 furloughed civilian workers from the Department of Defense, delayed paychecks for active duty military, the closing of the Chemical Safety and Hazard Investigation Board, which is responsible for investigating some of the worst kinds of chemical accidents one can imagine (including the recent West Fertilizer explosion, which killed 15 people), and the closure of the Commodity Futures Trading Commission, which overseas commodities futures trading – a practice that if abused, could help contribute to the kind of financial shock we saw in 2008. The Defense Nuclear Facilities Safety Board, which “identifies the nature and consequences of potential threats to public health and safety at the Department of Energy’s defense nuclear facilities,” would be closed down completely in the event of an extended shutdown. Our intelligence assets have been compromised as well. Allegedly 70% of CIA and NSA employees have been furloughed, along with 4,000 computer specialists working for the U.S. intelligence community. The CDC [Center for Disease Control] is having trouble tracking food-borne illnesses under furloughs, it is no longer monitoring the spread of influenza and other infectious diseases. Meanwhile the National Institute for Health is turning away “200 patients each week from its clinical research center, including children with cancer.” The Environmental Protection Agency just stopped clean-ups at 505 Superfund hazardous waste sites sites in 47 states. In a broad sense, the shutdown is affecting U.S. foreign policy as well, leading to a cancellation of a very important Presidential trip to Asia (part of the U.S. rollout of the U.S. “Pacific rebalance,” which was interrupted by the events of the Arab Spring in 2011), and a general perception that the U.S. cannot even keep its house open, never mind act effectively on the international stage. As China grows and expands its influence in the Asia-Pacific region, for example, U.S. leadership seems generally absent (physically and symbolically), and this event could have significant consequences for national and international security in the future. On a more prosaic level, the shutdown may also affect the work of our routine diplomatic services across the globe. And where do climate and weather threats fit into this picture? As one might expect, the resources and institutions responsible for addressing climate and weather risks, and slow-onset natural disasters, have been hit hard. This is problematic because these are the kinds of risks that require unbroken and ongoing attention. According to Climate Central, over 55% of the National Oceanic and Atmospheric Administration has been sent home, including employees of the Climate Prediction Center, routine maintenance of weather equipment is prohibited, climate research is on the shelf (apart from a few weather and climate models), only 3% of NASA’s workforce is on the job (NASA is the largest recipient of climate research funding), and only 8% of the Department of Energy is reporting for duty. 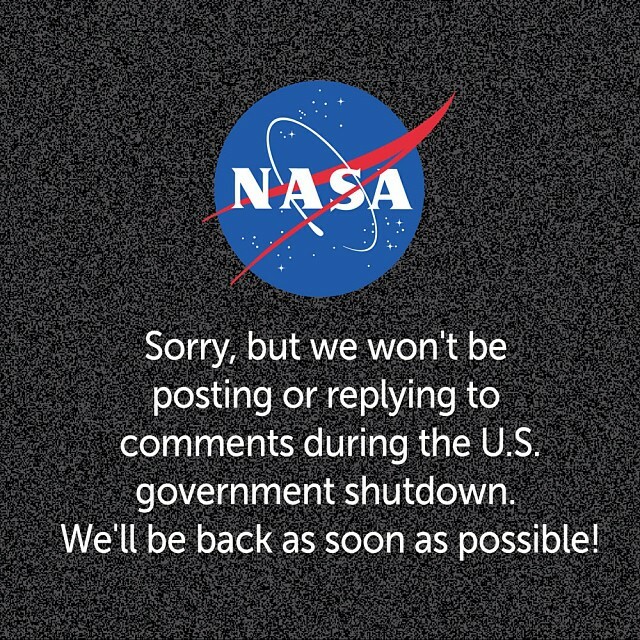 …the primary NOAA and National Weather Service Twitter feeds, with over 250,000 followers, have stopped disseminating information…the National Weather Service’s Facebook page, with 193,000 fans, has not been updated since prior to the shutdown. Clearly, more than a walk in Yellowstone Park has been affected by the shutdown. And while the U.S. government remains in a partial limbo, it may be a good time to reassess how we define “essential” services – particularly in an age of increased climatic risks. As Oscar Wilde noted, “Experience is merely the name men gave to their mistakes.” Let’s hope this “experience” leads us to better preparedness in the future. By Caitlin Werrell and Francesco Femia in climate and security on October 8, 2013 .